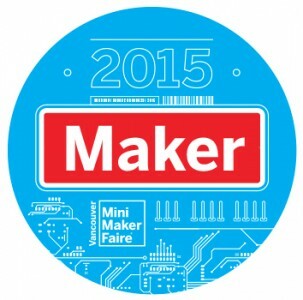 » PHAS Outreach » 2015 » June » 02 » We are going to the Vancouver Mini Maker Faire! Before talking about our upcoming participation in the Vancouver Mini Maker Faire, we would like to use this opportunity to say “Hello World!” Indeed this is the Outreach Program’s first blog post. We are excited to use this blog to share our upcoming events, fun & educational hands-on activities, “behind-the-scene” stories, and profiles of physicists and astronomers in the department. Make sure to watch this space for more to come – and stay in the loop by subscribing to our Outreach Program newsletter. Today we want to give you a very short preview of what you will see at our booth at the upcoming Vancouver Mini Maker Faire on June 6/7 at the PNE Forum. Hosted by the Vancouver Maker Foundation, VMMF is an annual event, probably the most awesome show and tell in the city. Local Makers gather and showcase the things they made – from electronics, crafts, to 3D-printed anything. We are excited to be part of the VMMF this year together with the UBC Engineering Physics Program. AND our super popular hovercraft (yes, you can stand on it), plus a few other mystery projects 🙂 All these are projects everyone can try to make at home. The Engineering Physics Program will showcase robots from the ENPH 253 robot course (last year’s challenge was Indiana Robot and the Temple of The Zipline), and show samples/videos of waterjet cutting and laser cutting in action. That’s the most we are willing the reveal, the rest you will need to find out at the VMMF this year. See you then!